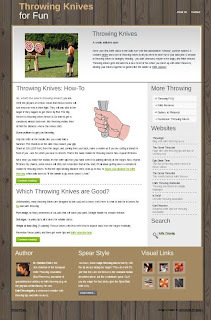 EN At www.ThrowingKnives.eu, there is a new guide on throwing knives. It quickly gets the reader going with the throwing, and gives hints on good knives. The goal of making the page was to provide concise and condensed info on throwing, to give even the casual page visitor the urge to go to his backyard and give the knife tossing a try. So, wheter you want to start throwing, or need a page for friends who want to know where to get started with throwing knives, you now know to go to www.ThrowingKnives.eu.